As companies experience higher costs for energy, it is becoming clear that an alternative to the traditional desktop is needed. A ‘green’ PC strategy is not only beneficial in terms of ethics and corporate responsibility but it can also significantly reduce energy costs. According to the Carbon Trust, office equipment such as desktop PCs, monitors and other IT equipment accounted for 15% of the UK's total energy consumption in 2007, with it rising to 30% by 2020. Think of the cost savings that could be experienced by finding energy efficient IT equipment. Eurocom looks at the total environmental impact and cost savings of its All-in-One PCs based on the manufacturing, transportation, product usage and recycling of the products. Sustainability is becoming an increasingly important part of every business; what any IT manager should consider when procuring desktop PCs to lower their costs and environmental impact will be explained below. The total environmental impact must take into account the entire product life cycle from manufacturing the product to its transportation from the factory to the customer’s door, through the regular use of the product to finally its disposal and recycling. Across the board Eurocom Energy Efficient All-in-One PCs will generally result in energy cost savings for all parties involved and a lower environmental impact compared to typical tower desktops systems. According to CDW’s Energy Efficient IT Report, a top energy-saving measure used by successful organizations is to buy computers that employ newer, lower-power/low wattage processors. Eurocom All-in-One PC systems are more efficient to produce because the entire system is enclosed in one form factor. Only one piece of equipment is produced but provides the same benefits as traditional desktop and monitor systems. Manufacturing a small form factor All-in-One system is a much more efficient process than manufacturing two large pieces of equipment. Incorporating a more efficient manufacturing process allows the manufacturing party to pass the savings onto the customer or reseller and decrease the environmental footprint of the product. Another important factor to look at is the use of materials with low impurities in the product as many plastics and electronics are full of lead, mercury, arsenic, cadmium, hexavalent chromium, polybrominated biphenyl and polybrominated diphenyl ether flame retardants. Eurocom All-in-One PCs which are ROHS compliant, which means they contain low levels of the above mentioned substances. ROHS is a directive aimed at restricting the use of six hazardous materials in the manufacture of electronic and electrical equipment. Another benefit of Eurocom All-in-One PCs is the lower weight associated with them. Having less weight in a piece of equipment means less material is used in the production of that object resulting in the production of fewer carbon emissions and conserving resources. A lightweight design also increases the efficiency of the transportation of that product because lighter objects need less energy for transport. The transportation component of a computers product life cycle is another time when the Eurocom All-in-One lightweight space saving design will improve efficiency. Due to the small overall size of the product and its packaging, more systems can be transported in a given space while the lower weight of the product results in less energy consumption. This results in lower shipping costs which can then be transferred down the supply chain and a lower overall negative environmental impact. During the product usage phase the cost savings of the product can be directly transferred to the end user. Low power consumption of a 90W Eurocom All-in-One system translates into a roughly 70% cost savings over a typical desktop system that has a 200-500W power supply. 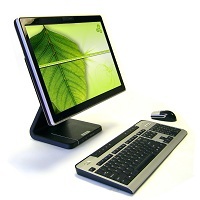 A Eurocom All-in-One system with 74W power consumption in max mode also runs at 53W in min mode and 0.6W in power off. When buying a system or even multiple systems IT managers must look at energy consumption because over a full year across multiple systems the savings can be huge. Due to the low power consumption designs of Eurocom All-in-Ones the systems create much less heat, which in turn contributes to the systems lasting longer because the more heat, the more likely component is to fail. Decisions by consumers on how PCs are used and disposed of have an enormous effect on environmental impacts. Extending the usable life is very effective for reducing all types of burdens, explains Computers and the Environment, by Ruediger Kuehr and Eric Williams. The space saving design of Eurocom All-in-Ones allows companies to incorporate multiple systems in an office or computer lab setting. More computers can be fit into a specific area and more space can be afforded to each user. According to CDW’s Energy Efficient IT Report 74% of organizations have or are developing programs to manage and reduce IT energy use. After the useful life of the product the system must be disposed of. Many systems, tragically enough, simply end up in a land fill. Having an accreditation like ROHS on a product means it is fully recyclable because of the low levels of impurities in the materials. By having products that are designed to be used long term, customers can use the product for a longer time thus reducing the amount of computers used in a given time period. So when looking to buy multiple systems for business use or a personal computer for personal use there are many factors to explore. It all comes down to the needs and wants of the users, but every responsible purchaser should look at the total cost of ownership and the environmental impact of the product if nothing else. Far too often customers are exclusively concerned with frivolous features of a product without seeing beyond to more important issues such as how much the product will cost in energy consumption. For businesses more than personal use, much more emphasis is placed on total cost of ownership of a product, because of the benefits Eurocom has seen more and more businesses adopt All-in-One PCs.